Hello. This is Dr. Anderson with Apollo Audiobooks. I’m gonna go through the handout that we gave to all the attendees at the live conference and I’m gonna go through it verbatim. I’ll also include a little extra information. The handout is basically given to you so that you can have a written record that you can keep with you and I encourage you to print off a copy of the handout and keep that in your kitchen and print off another copy and give it to your spouse if your spouse does the grocery shopping, and you can even keep a copy at the office. So take the handout with you and use that information. But we’re gonna go through it verbatim for those of you who will be watching this on the internet, or for those of you who will be listening to the audiobook version of this conference. 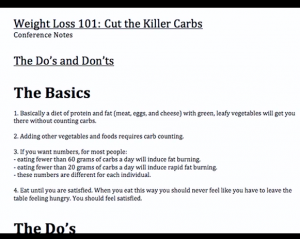 So this is the handout from Weight Loss 101, the Cut the Killer Carbs Conference. And basically we’re gonna cover a lot of the Do’s and the Don’ts. Let’s start off with the basics. Basically, if you eat a diet that contains protein, fat and green leafy vegetables, that’ll get you there without having to cut the carbs. Protein and fat includes meat, eggs, cheese – eat all you want of those and eat all you want of the green leafy vegetables. However, if you add other vegetables and foods, then that’s when you start counting carbs. So let’s say you don’t just wanna eat green leafy vegetables, but you wanna add certain fruits or certain milk beverages – then you have to start counting the carbs to see how many are in those types of foods. Number three, if you want numbers, for most people, eating fewer than 60 grams of carbs a day will induce fat burning. So if you’re a numbers person and you want to count the carbs, then try to keep your carbs below 60 and you should notice weight loss. However, for most people eating fewer than 20 grams of carbs a day will induce rapid fat burning — so 60 for fat burning, and less than 20 for rapid fat burning. The numbers are different for every individual, so you have to tailor it to what works best for you. For example, you may be able to lose weight eating 80 grams of carbs a day, or you may have to eat 50 grams of carbs a day to lose weight. Now, just as in the conference, when I talk about carbs I mean net carbs. So when it comes to counting carbs you’ll count net carbs and that’s what we’ll talk about a little bit later. Number four, always eat until you’re satisfied. When you eat the Cut the Killer Carbs way you should never feel hungry. You should never leave the table feeling hungry and you should feel satisfied. What I do lots of times is I’ll eat a plate, then after that I’ll eat more of the same sort of foods that I know I can eat as much as I want of, and then if I’m still hungry at that point I’ll eat nuts. And I don’t emphasize nuts enough in the conference, I believe, but I tell you, you can have nuts for a snack; you can have nuts after a meal; you can have nuts before a meal. Nuts are really a wonderful food that got lots of good protein, lots of good fat, and they have minimal carbohydrates. So let’s start out with the first section and that is The Do’s. You may hear me click a little bit here, and that’s because I’m going through this just as you would go through it on your computer. 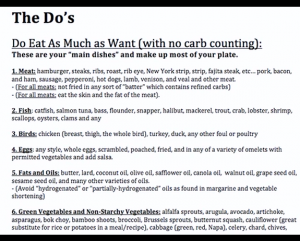 So these are the Do’s, and the whole point of this section is that anything that’s in the Do’s, eat as much as you want anytime you want, any time of day, and if you want more eat more. You can eat all of this you want without ever having to count carbs. This really worked for me because the whole idea of counting calories and counting carbs and tracking everything, that just seemed unnatural to me. I just wanted to know what I cuold eat and what I couldn’t eat. I do occasionally count carbs if it’s a new food or if it’s something I’m unfamiliar with. First of all, for the Do’s: Do Eat as Much as You Want without Carb Counting. That’s what the main dish is in your plate; they make up most of your plate. Number one is meat. Meat includes hamburger, steaks, ribs, rib roast, rib eye, New York strip, strip, fajita steak, etc. Meat also includes pork, bacon, and ham, sausage, pepperoni, hot dogs, lamb, venison, and veal and other meats. For all meats: you don’t want it fried in any sort of “batter” because the batter is made of wheat and it contains refined carbs. Also for all meats, you can eat the skin and the fat of the meat. Don’t be afraid of the fat. Number two, fish. Eat any kind of fish you want, including catfish, salmon, tuna, bass, flounder, snapper, halibut, mackerel, trout, crab, lobster, shrimp, scallops, oysters, clams and any other kind. Eat all the fish you want. Number three, birds. Birds include chicken, and that includes the breast or the thigh, dark meat, white meat, whatever – eat as much as you want. You can also have turkey, duck, or any other foul or poultry. Number four, eggs. We eat a ton of eggs, eggs are really what make up the bulk of breakfast – it’s either eggs or a protein smoothie. You can have eggs of any style, whole eggs, scrambled, poached, fried, and in any of a variety of omelets with permitted vegetables and add salsa to spice things up. Number five, fats and oils. You can have as much of the fats and oils as you like; it’s no longer the top of the food pyramid. As long as your body is burning fat, you can consume fat and your body will burn it. It’s when you start consuming all the refined carbohydrates that your body produces too much fat in your blood. So you can have as much as you want of butter, lard – yes, even lard — coconut oil, olive oil, safflower oil, canola oil, walnut oil, grape seed oil, sesame seed oil, and many other varieties of oils. Note, you will want to avoid “hydrogenated” or “partially-hydrogenated” oils such as found in margarine and vegetable shortening. Those are known to be very bad for your heart.